The competition for Best Princess Ever is in full swing! As Lumpy Space Princess, Fire Princess, Muscle Princess, and more compete for the title, it's discovered that someone is sabotaging the games. 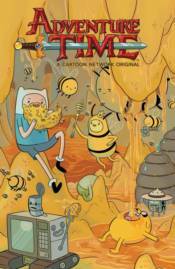 With Finn and Jake on the case, Princess Bubblegum will have to keep the show going until they can track down the true culprit and save the day. Written by The New York Times bestselling author Mariko Tamaki ( This One Summer ) and illustrated by Ian McGinty. Collects issues #62-65.